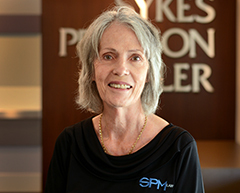 Referred to by the team as "SPM's face of Cooroy", Jan Armstrong can be found Monday to Wednesday manning the Cooroy Office. Jan has many years of experience in the legal industry so we were delighted when she joined the team early 2018. In addition to running the Cooroy office, Jan acts a paralegal to our professional team. With years of administrative and customer service experience as a legal secretary, Jan has a level of professionalism and genuine interest in her work that is to be commended. A Cooroy local since the 80's Jan enjoys the beautiful Noosa Hinterland and in her spare time can be found renovating vintage furniture, reading and walking. Small of stature, big of heart and in her words "made of steel" - Jan is a true delight.